"Who leads? When do I assert my opinion, and when do I step back?" Take a glimpse into Movement and Improvisation in A Day in the Life at UVM. the Vermont Dance Sampler, Vermont College Dance Festival, hosting the American College Dance Association, and much more. 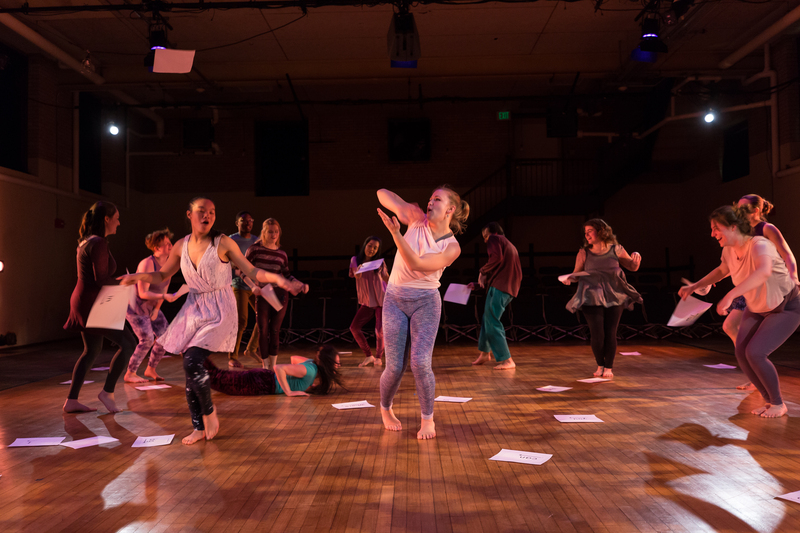 Dance alum returns to the UVM stage where she discovered her "dance personality"
Nine years have passed since Heather Cairl ’09 performed Dirthead, a solo piece she created as a UVM dance student. Paul Besaw's solo piece morphs into a collaborative solo dance series. UVM Dance expands students' knowledge of dance as a performing art form. Open to both new and experienced dancers, the Dance Program provides students with the opportunity to develop and expand what dance represents. The Dance Program facilitates rich and meaningful interaction between faculty, guest artists, and students. The heart of the program lies in modern/contemporary dance, but practice and theory are embedded in all dance courses. Julian Barnett Premieres New Work "X (Two Strings)"
Site-specific performances, formal dance concerts, master classes, and more. With departmental emphasis on student creative work, we have many opportunities for you in the Dance Program. Explore the art of dance through technique, composition, and performance.